You were on The New Yorker staff for ten years – handling podcasts and illustrations. Most people would think that was a pretty good job. So why did you make the switch to writing? I went to New York to try to be a writer, but I didn’t have the resources to just start out as a freelancer, so I needed a job. I went to a temp agency out of desperation, and they gave me a Microsoft Word test. I got a hundred percent, and they’d never seen anybody get a hundred percent before. They were very impressed, and so they sent me to interview for the best job they had, which was in the marketing department at The New Yorker. Back then – now it’s all part of Condé Nast – but back then The New Yorker still had their own human resources person who did business and editorial, and he said to me, “Seems to me you should interview for something more editorial.” There was an opening in the illustration department. I hadn’t gone to art school or anything – they just needed someone organized, an assistant. But after a while, I organized them pretty well, and I almost worked myself out of a job. Everything was running pretty smoothly, so they started giving me more work – “Here, just edit that illustration.” And I’d seen it done. So I ended up an assistant illustrations editor, sort of the third in the department. I worked with John Ritter, who did the cover of my book, so when I did the cover of my book, of course, I was able to articulate exactly what I imagined as the cover I wanted, and I got it. John Ritter made it even better than I could have imagined it. Because it’s very much a people story. In fact, I thought of the challenge of telling this story of an interstate highway – a story full of conflict, full of big concepts and questions – the challenge of telling it through the lives of individuals. How did you arrive at what the structure of the book was going to be? I struggled with that for a long time. That was the hardest part. I had done all my reporting and then it was time to write. You sit down, and you don’t know where to begin, because all of those lessons, all of the explanations about the history of the highway system, and the policy of privatization, it’s all in your head and it’s tempting to just go at it. I could have just crammed essentially all of the broader lessons into one chapter if I needed to, if I was going to write a magazine piece, but I knew that I had to spread them out, to make them more interesting, to make the thing more readable, and I didn’t want to deliver a lecture on the history of road funding unless I had a place or a person that could carry that on their shoulders. How soon in the process did you know that you were going to hang the book on the stories of individuals? I just took that for granted. Because even though I wasn’t a staff writer at The New Yorker, The New Yorker style and The New Yorker ethos was imprinted on me, this kind of narrative nonfiction. And I did not want to make it a boring book. The history and policy lessons, for me – the reason I was interested in learning them­ – was because of the people I’d met. So I wanted to keep that connection when I delivered the story to the readers. So I did a grid. The first realization was that I needed to break apart the regions, because this really was one story in Indiana, one story in the South, and a different story in Texas. So that was step one. Then I thought, well, the Genesis story – not that my book is the Bible – but I think of the first and last sections as Genesis and Revelations, it’s like everything starts and gets created in the first of the five sections, then you watch it play out over three books. I knew I was going to make these three geographical sections and an opening section and a closing section, so I charted these out on the X axis, and then on the Y axis I wrote all of the different road funding questions, the tension points that I wanted the reader to experience, and then I charted out where in each of the five sections that story line would be, so whenever I was writing a section I would know, “I have to teach them about this, and I have to settle that. I have to make that more complex, so that it can be resolved here in the fifth section.” That chart took me months. It goes back to your organizing The New Yorker. What was the kernel – the original seed for the book? The first people I spoke to were the Tokarskis, here in Bloomington. So I was introduced to this highway from their point of view, that this was a crazy project that shouldn’t be built. 2002. This was when the dramatic public meetings were happening. The original environmental impact statement. Not the original one. The second one. The original one was thrown out in 1996, because [the Indiana Department of Transportation] hadn’t studied all the alternatives. They had to start over, and so the second one was coming to a head in 2002 and the governor was eventually going to make his decision on the route. It was a very intense moment. And even though I lived in New York, worked at The New Yorker, and this was a time – after 9/11 – of great focus on international issues, my heart was always in the middle of the country and on domestic politics and these issues of development. I was learning about urban and regional planning and what I now know is called “human geography.” The Tokarskis were great people to meet first because they’re so passionate. And they had a good handle on the facts. It’s very personal and yet they have a broader picture. And the broader picture’s not just a Band-Aid to make them seem less selfish. They really are outraged by the spending and what they see as out-of-whack government priorities. And eventually we got to the name of David Graham. Who’s from Washington [Indiana], not Evansville. He’s from Washington, right. And Jim Newland was from Washington, too, and they were boyhood friends. It’s just a sweet local story, it turns out. When I met David Graham, I already knew that he’d been instrumental in starting I-69. But Jim Newland had not told me about his long drive to find compatriots in other states, had not told me about the Graham family history. David Graham was sort of shy to tell those stories. He said he didn’t feel like he wanted to be the focus. His work was done, and he wanted to fade back now. But I eventually got him to trust me. He liked that I had gone to DePauw and grew up in Indiana, that I wasn’t just some city slicker from New York. You said that you liked the Tokarskis, and you liked Jim Newland. If I put myself in your shoes, it would have been difficult to find myself liking the people who are very divided on this and I would feel, “I have to decide where I stand – but if I decide where I stand, how do I talk to people and sit down and have dinner with them and drinks or whatever?” You came into their homes. These weren’t just formal interviews. You were hanging out with them. How did you deal with that in your own head, that feeling that you were crossing from one side of a battlefield to the other? Or did you not have that feeling? I definitely had that feeling. I was very aware of it. In fact, I had to be careful not to pass too much information back and forth. The Tokarskis didn’t know the story about David Graham driving up and down the route until they read the book. Graham drove all the way through the states that became the terrain for the highway. Yes. Even after the idea of a multistate corridor arose, no one was really ready to grab it with both hands, so David Graham took it into his own hands. When he was coming home from vacation in Cuernavaca, he cold-called the Chambers of Commerce in Houston, Shreveport, and Memphis. It’s an amazing story. And that was the story, when I heard it, I thought: “This is a book.” That was the beginning. Then I knew for sure it was a book when I met John Caruthers in Shreveport. I was sitting in his office, where he and Graham had drawn the map [of an I-69 route through seven states], and John Caruthers was showing me, out the window, the town of Shreveport and how it had come about. I guess I thought I was going to meet John Caruthers, and here was this “oil man” who was leading a group of “business people” to build this highway, and I thought he was going to be kind of a cynical guy. No! He is more romantic than the Tokarskis are, or at least as much of a romantic. He was writing this novel, and he’s very sentimental about Shreveport. So the more I met these people, I realized there was heroism on both sides of this story. In John Caruthers’ office I learned that this type of story – this small group of people doing a big thing – is what happened over and over again and what built this country. I suddenly had context. 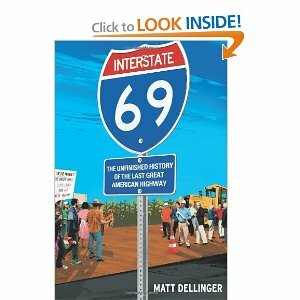 Everyone was always asking me, “Is your book for or against I-69?” And I had the hardest time explaining to them that it was neither. In fact, there was a publisher who I think turned down the book because they wanted it to be a polemic one way or another. I guess they thought that might have sold better. One of the strengths of the book is that it gives pictures of the recent history of a lot of places that we could call forgotten places in America where the children have left, the railroads are gone that caused those places to exist, and they’re just dying. And you open a window on that part of America. So it’s bigger than just a book about a highway – it becomes a series of snapshots of forgotten places. I wonder if at any point when you heard people talk about how they needed this so much to develop their economy and stimulate jobs, did you ever think that maybe towns that were built in the past should simply be allowed to die in the present? That occurred to me. And another part of me wondered if they might live again if they bring back the railroads, which is the original reason these towns were born. There’s an editor, John Bennet, the guy who edited my first article at The New Yorker, who used to call me a young fogey, because here I was in my 20s writing about folk musicians and trying to write about small towns in Indiana. I grew up driving, but I live in a place [Brooklyn] where I can go and visit friends in Boston or DC or Philadelphia, and I can get from my front door to their front door using only trains and sidewalks, and I love that. Which you used to be able to do in Indiana. There was a good train system that connected all these little towns. You would like to hook them up with railroads. I don’t see why that might not happen to some extent again. It won’t be like it was. Are you working on another transportation book? No, I’m not quite there yet but it has occurred to me that a book about trains might be a nice follow-up. How has it been, now that you’ve finished this work, and it’s all over but the reading –the reading people are doing, the readings that you’re doing in different places. Do you have a moment of letdown? I think I will when the tour is over. You know, book tours are kind of a thing of the past, actually. But it was important to me to do a road trip, to go to Dumas, Arkansas, and go to Shreveport, and go to Evansville, even if twelve people show up. I worked hard to get a reading in Paducah. I wanted one in every state. I didn’t want to leave anyone out. Not because my presence is some great gift, but one theme of the book is that these places feel that nobody cares about them. I do care about them, and I grew to care about them even more. So this tour is kind of a last look around for me, a last hurrah. I’m getting to see all the people who I interviewed and wrote about. This is one long trip? You spent a lot of time on the road before doing the book, and I assume that was in different segments, at different times. Yes, except that there was one three-month period when I took a leave of absence from The New Yorker and I lived for a month in Indianapolis and a month in Memphis and a month in Houston and fanned out from there. And that’s really where I collected most of my reporting about the Mid-Continent Highway Coalition. I got to go through people’s papers and files and compiled all those meeting minutes. I wouldn’t have been able to tell that story if I hadn’t taken a big chunk of time to live along the route and soak into these places and go visit Dyersburg for three days. Were you alone when you were doing this? Was it lonely? How did you stay cheerful? I guess you didn’t have to stay cheerful. I was cheerful. I wasn’t lonely. I was talking to people every day. In Houston I stayed with my dad. In Indianapolis I stayed with my brother. And in Memphis, there’s a place called the Little Tea Shop where everybody has lunch downtown. The woman who runs it introduced me to a woman who was on the board of this metal museum that had a guesthouse, so I stayed on the beautiful grounds of this museum in Memphis, and the director and his son lived there. So I was always embedded in a wonderful way, and then constantly talking to people. But writing is a lonely act, much more lonely than reporting. The loneliest I felt was when I was home in Brooklyn typing away. Were you still working at The New Yorker at that time? I tried to start writing while I was still at The New Yorker, and the reason I left was that I just didn’t have the discipline to pull it off, to do both. I think I would actually have that discipline now. When you’re doing it for the first time, as you work you realize the size of what you’re doing, and it continues to surprise you. You think you’re getting to the peak of something, and you look over and there’s just another rise – there’s more, there’s more. I think I just had to put my head down and charge through it until I got over the hump. My next book is going to be easier. All writing is going to be easier. I guess I mean, now I know. I know I’m eating a moose and not a mouse. You were writing for magazines while you did this. And you did try to pitch the I-69 story to The New Yorker and the New York Times Magazine. They don’t say much. They just say “It’s not for us.” But I think when I look back 2003 was the exact wrong time to pitch this. Now, with the election in 2008 and the economy collapsing and the housing market, even going back to Hurricane Katrina –those events pulled people’s attention. But back in 2002 and 2003, everything was Iraq and Afghanistan and war and national security and homeland security. Which means they didn’t like it. You have a good bit on the Tokarskis and on Texas folks who opposed it. You tried to go to an anarchist meeting [in Chicago] – people who were coming to Indiana who were critical of the highway in a more Monkey Wrench Gang kind of way, and they told you that you weren’t really welcome at their meeting at the bookstore in Chicago and didn’t want to talk to you. I wondered why you didn’t just go to the meeting. It was publicly announced, wasn’t it? It was announced on anarchist websites. Was it in a little bookstore? Was it in a back room? Exactly, a back room of a little bookstore in Chicago. So it felt more like a private – I wanted to know if next time I go to an anarchist meeting I have to announce myself. You think you do? If it’s a public event? I don’t think you have to. But I think that they are on the lookout for people who they shouldn’t trust. They would have assumed that I was a reporter – actually they would have assumed first that I was an FBI agent. You kind of look a little like an FBI agent. I have very short hair, I’m balding. I’m thirty four – it was a couple of years ago, so I wasn’t going to blend in. I also –maybe I’m an unsavvy journalist in this regard, but I never felt the need to use undercover investigative reporting tactics with this book. I wanted to tell their stories and I wanted to gain their trust, and hear from them, and ask them questions they would have thought were irrelevant to the business of a meeting. I was asking David Graham all about his family. I couldn’t have done all that if I was pretending to be something I wasn’t. I wanted to sit down with Hugh Farrell and say, “Where do you come from? You went to North Central High School in Indianapolis. I went to Pike. We grew up virtually the same. And here I am and here you are. And when did this happen? When was the moment where you got angry about this stuff? Do you think the people you’re sort of leading have in them what you need them to have to do what you want done?” I wanted that level of conversation. You didn’t just want to observe a meeting. Well, I did want to observe a meeting too. But sneaking in there would not have been conducive to eventually gaining their trust. And I did eventually gain their trust, to some degree. It got to the point where when they were doing their protests and such, I did have email or phone contact with some of them. They were feeding me information. I was able to fact-check a few things. “The local people are saying this many people were arrested. Is that true?” So it helped. None of them really wanted to be directly interviewed or directly quoted, but it meant that when I showed up at their torchlit march through the streets of Bloomington, I could blend in more. Hugh knew who I was, and I could stand right next to him and take pictures and no one thought I was a spy. “Tiga,” yes, Gina Wertz. I emailed with her recently. She’s up in Maine, working on a farm. I sent her a book. Hugh, I never had an email address for, and his phone is no longer working. I asked people who knew him to alert him to the book. He’s an interesting guy. They’re all interesting people. I’d like to talk to Hugh again some day. I’m curious about the expenses of doing the reporting for the book. You were working for The New Yorker still for part of that time, so you were on salary. Do you mind telling me what kind of advance you got from Scribner. It’s what they would probably call a “very nice” advance – nothing jaw-dropping. Did you have any other sources of financing? I tried a couple of think tank applications, and I tried supporting myself by free-lancing for a while. But you end up doing more work. If that was all I was doing I think I could be a freelance writer. I think I could actually make it work. But you’ve got to wake up, research stories that no one might ever pay you for, pitch stuff, send hundreds of emails to editors, meet people for lunch. The hustling takes a lot of work. So trying to write this book and do all this hustling, come up with ideas, research those – I didn’t have the mental bandwidth for all of that in addition to the book. It’s like a Victorian novel – like a Dickens novel. It was – which is why I needed that grid to keep me organized. You’ve gotten really enviable reception from media – an NPR interview, reviews in the Wall Street Journal and in The New Yorker, you made Vanity Fair’s weekly best list, and you’ve had good publicity by media along the I-69 corridor. Was that all your publisher’s doing or did you have to work yourself? There’s a lot of teamwork. The publisher has its strings to pull and its strong channels. With the media outlets along the route, I’d been reading these newspapers in my research, so I made a list of those and then Scribner did the hard work of sending the books out, calling the papers and harassing them. The NPR thing, On Point, I had been on The Takeaway several times and I blog for a public radio site called TransportationNation.org. So that helped. And generally, after ten years in New York working in media, I have acquaintances all over the place. And frankly that helps you get attention. And it depends on the writing. It worked for you really well. I’ve been very fortunate. Which is not to say anything has been a cakewalk. Trust me, the New York publishing world is not exactly swarming with people who care deeply about highway dramas in small-town America. The book wasn’t an obvious sell. And the number of articles I’ve succeeded in publishing is dwarfed by the number of things that were turned down, even after they were written. How early in the process did you get a contract with Scribner? The contract came in 2006, so I’d been working on it for four years. Exactly. I hadn’t seen any minutes of the Mid-Continent Highway Coalition meetings. All the interesting details about their activities and how all the lobbying worked I got when I took my leave of absence. And some of the more interesting people I met, some of the people in the Valley of Texas, say – I hadn’t met when I wrote the proposal. You published the book before this story was over. Did you have any worries about that? Did your publisher have any worries about that? We don’t know yet for sure if the highway will be built through Indiana. The book was always designed to be an unfinished history, because otherwise I’d wait twenty years. The principal characters in this book are getting older, and a few have died, so I wanted them to be able to see this book. I wanted me to be able to see this book and not have it be my obsession for twenty years. I think it’s actually a motivation for readers because the story’s not over. If we knew the ending, it might not be as interesting. Yes. I think it’s more interesting as a molten piece of journalism. Here’s a book that tells the whole story and yet might affect the story. It can still change. People can read this book and say, “We never knew this and this is a powerful argument for our side.” And ironically both sides have kind of embraced this book. Some of the people fighting it think that this book finally shows that this was a bunch of rich people who got together and asked for this, that this is not a needed public investment. And the people who are for it – the Mid-Continent Highway Coalition was out of gas. It had almost evaporated. And this book – they’re trying to use it as a rallying point, and to try to get new people interested. So I feel like I did a decent job of being balanced, and that feels good, and I think that this will become an anchor point for me writing a lot about roads and development and other related stories. I will continue to do that with my blogging for transportationnation.org, the public radio website. I backed into becoming an expert on all this transportation stuff, but now that I am, I feel a certain responsibility to use that knowledge. You can keep up with Matt Dellinger’s work at http://www.mattdellinger.com. Matt’s photo by Yancey Allison (http://www.yanceyallison.com/). Use the contact form below to write to Matt Dellinger or Carol Polsgrove.